In the Christian calendar, February 2 is the Feast of the Presentation of the Lord, also known as Candlemas (or “Candle-Mass”). This year, it falls on a Sunday, and we’re going to observe it in a new and special way at Compline at St. Mark’s Cathedral in Seattle, and so I wanted to give you a preview. In addition to Simeon, an elderly woman named Anna prophesied about Jesus as the long-awaited messiah – in fact, she is the first to utter this prophecy. The Christian celebration of the feast of the Presentation (earlier called Purification) can be traced back to the early fourth century. When the birth of Christ became set to December 25, the celebration forty days later on February 2 was almost exactly midway between the Winter Solstice and the Vernal Equinox, coinciding with the returning light and the beginning of preparation for spring planting. It became the time when candles were blessed for the new year, and carried by everyone in a great procession. Compline was influenced by themes of light and salvation, and the Nunc Dimittis was made a key part of the Cathedral observance of the office. Jesus, as the “light of the nations,” gives us hope and encouragement as the day’s light dims and darkness takes over. And the themes of salvation and resurrection give us hope at the time when sleep presents us with a portent of our own death. At St. Mark’s, people will receive candles on the way in to the Cathedral. The Compline Choir, Dean, and acolytes will gather in the chapel behind the altar, where the candles will be blessed, and the Nunc Dimittis sung with its antiphon Lumen ad revelationem gentium. Then a procession will be formed and go out into the cathedral, with the choir singing the chant Adorna thalamum, while acolytes will pass the light to everyone’s candles. The procession will stop at the altar, while it is incensed, and then the choir will process to its normal place singing the chant Obtulerunt pro eo Domino (“They offered for him unto the Lord a pair of turtledoves…”). 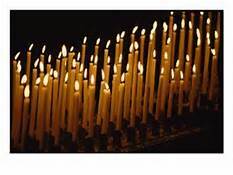 From there, the Compline Service will take place as usual – except it will be entirely in the light of everyone’s candles. Candles and incense and processions – oh my! Sounds like a beautiful way to celebrate this special midwinter day in the Emerald City. Happy New Year from the underground! Last Sunday was January 5, the last of the twelve days of the Christmas liturgical season. 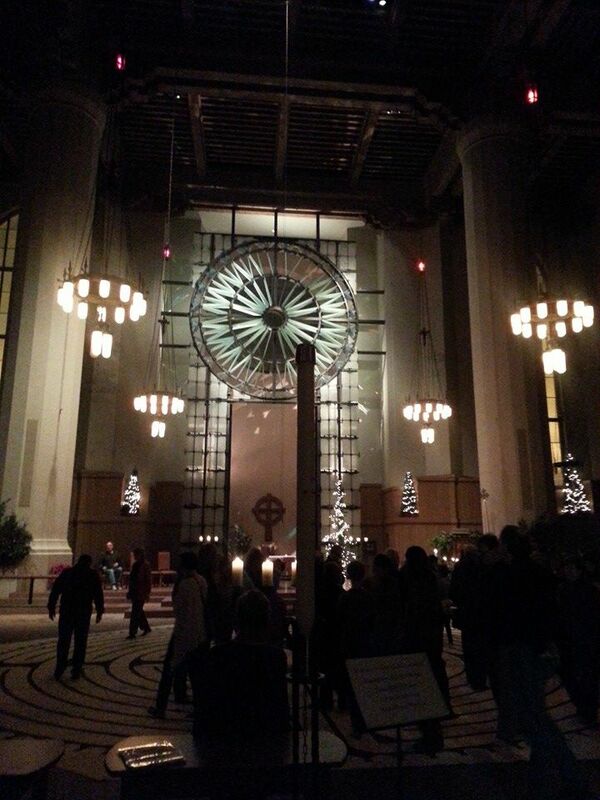 Our service of Compline fell on this night — “Twelfth Night,” which was also the Eve of the Epiphany. Both of the themes of the birth of Christ and Divine Light were captured by one of the anthems we sang at Compline: Lux Aurumque. It was a most meditative moment, with the dark space of the cathedral punctuated by the Christmas lights, which you can see in the picture taken on New Year’s Eve. By January 5, the Labyrinth was no longer there, and the only lights were those on the trees and suspended on the walls — but it still gives one an impression of what it was like. Lux Aurumque was written in 2009 by the composer Eric Whitacre, to words by the poet Edward Esch which were translated into Latin by Charles Anthony Silvestri. The use of Latin gives a kind of ancient, evocative quality to the words, and enhances the mystical effect of the music. Whitacre composed a version for mixed voices at first, but then did a version for men’s voices, which is what we sang. If you want to learn more about Eric Whitacre and see the YouTube Virtual Choir singing the original version, click here. I wish you many blessings in 2014.